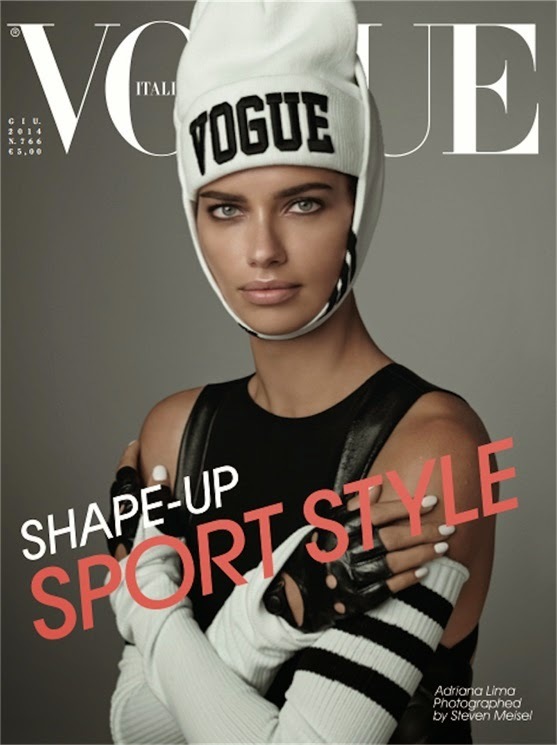 Following a week's absence, IMA gets back into the swing of things with an action-packed Vogue Italia editorial and cover story featuring Brasilian mega-model Adriana Lima. The thirty-three year old seasoned veteran and mother of two appears to be at the very nadir of her modelling career captured by photographer Steven Meisel for her first ever Vogue Italia cover. Lima is "Ridiculously Gorgeous" as she poses in athletic-inspired ensembles styled by Fashion Editor Carylne Cerf de Dudzeele. Lima maintains her grace and composure under pressure with flawless make-up looks and slightly damp hair streaking her brow courtesy of make-up artist Pat McGrath and hairstylist Guido Palau. Since being discovered at age 15 via Ford's "Supermodel of the World" competition, Lima has traversed the worlds of high fashion and commercial modelling with relative ease. Better known for her on-going role as a Victoria's Secret Angel and spokesperson for Maybelline cosmetics, Lima has in recent years increased her high fashion profile via turns on the runway for Givenchy, Prada, and Jason Wu. Editorials bookings for American Vogue, Harper's Bazaar, W, Elle, V, and Paris Vogue, in addition to blue chip campaign gigs for Donna Karan, Miu Miu, and Blumarine have confirmed Lima's status as a bonafide modelling star. Lima's high fashion visibility shows no signs of abating in 2014 with cover appearances for the Spanish, Turkish, and Italian editions of Vogue, Interview Germany, and Spanish Harper's Bazaar.